A new take on an old folktale. 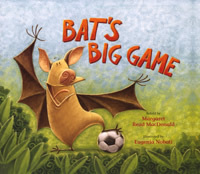 Bat wants to play on the winning side in the big game. So he plays first with the animals...then with the birds...then with...until he learns an important lesson. Eugenia Nobati's illustrations capture the movement of the fast-paced game in beautifully sweeping movement.